The TK Sliders are a new high quality sliding plate designed by Troy Kerr, farrier of worlds champion reining horses, and Equine Digit Support System, Inc. The general shape of the shoe has a bold toe with an arched bevel to allow better breakover and better stabilization during the slide. The Inside web of the shoe is made as straight as possible on the Regular and Super Slider models, to minimize friction over the ground surface of the foot during slides. At the same time, the outside perimeter of the shoe closely follows the radius of the foot to make for a close fit (meaning less chance of pulling shoes), yet does not hinder slide length. The TK Slider was developed to offer extensive benefits regarding function, soundness, hoof health, and ease & correctness of application. Below are a few of the unique features of these sliding plates. Breakover - The TK Slider's bold toe allows for an efficient drive position, thus eliminating one of the greatest causes of stress in the hind leg mechanism - a hind toe that is too long. An efficient breakover results in longer stride length and relieved pressure on rear tendons, joints and muscles. This makes for a deeper driving and smoother moving horse with a reduced chance of stumbling or stubbing a hind toe. The deeper driving and freer moving horses, the more balance he will be in all athletic maneuvers, especially stops, fast circles and hard turns. Stability - While allowing the hind toe to be better orientated to the coffin bone, the TK Slider provides optimum support directly beneath the central structure of the hind foot. This stability promotes greater confidence for the horse and critical physical support during difficult maneuvers such as sliding stops. The horse can feel where his foot is and push against the ground with his toe and central foot, knowing he has support where he needs it most. Closer Fitting Toe - The ability to fit the TK Slider full on the hoof but close at the toe results in decreased incidence of over-reaching. A truer hind foot flight path makes for improved overall balance of the horse, and the bold toe is less likely to snag a front foot if over-reaching does occur. The full fit to the rest of the hoof promotes solid support and protection, resulting in a sounder and more athletic horse. Stimulation - The inside branches of the TK Sliders are designed to avoid interfering with the ground contact that the hoof needs for good circulation. Opening the sole up to the ground surface allows the frog to make close contact with the ground, thus supplying good circulation. Following the Natural Balance hoof preparation guidelines will result in better overall hoof health and less instances of contracted heels and other problems due to poor circulation and support. Sliding - The straight inside branches of the TK Regular & Super Slider allow even the deepest soils to transfer across the bottom of the foot with ease. 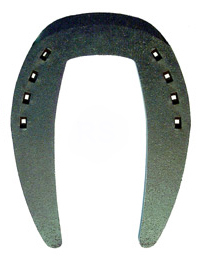 Support - The TK Slider is meant to provide a full fit to the hoof, yet is designed to stay under the horse. The shape of the shoe offers optimal protection with minimal interference.